Kathrine Jensen (June 7, 2005) | Burmeister-Johannsen Funeral Home, Inc.
Kathrine Jensen was born Kirsten Katrine Neilsen-Hjornet to Christian and Jensine Neilsen-Hjornet, on October 4, 1904. The family lived on a farm outside the village of Vittrup, in Vendsyssel, Denmark. Kirsten attended school from age 7 to 14, and at age 16, she entered the work force as a hired hand. At age 17, she met her future husband, Nels Jensen. Nels moved to the United States, and in December, 1923, Kirsten followed. The couple married on October 17, 1924, in Harlan, Iowa. After they married, Nels and Kirsten began their own farming business, living in the Avoca and Hancock, Iowa, areas but moving often for better farming opportunities. In 1959, they retired from farming and bought a house in Avoca. They became United States citizens on September 11, 1959, and Kirsten took the legal name of Kathrine Jensen. Following their retirement from farming, Kathrine and Nels began doing furniture repair and upholstering. After Nels’ death on December 21, 1990, Kathrine sold their home in Avoca and moved to Peace Haven Retirement Home in Walnut, Iowa. She lived there until late 2002, when she went to live with her eldest daughter, Elsie Baker, in Council Bluffs, Iowa. Kathrine was a lifetime member of the Trinity Lutheran Church in Avoca. In her spare time, Kathrine entertained the grandchildren, gardened, and fished. She and Nels made several trips back to Denmark to visit family. Kathrine also enjoyed quilting, sewing, knitting, tatting, and crocheting, and she donated many afghans to church fundraisers. Visitors to her home always enjoyed homemade bread and cookies. She liked growing flowers and was a member of the local Garden Club. The Avoca Journal-Herald named her “Homemaker of the Week” in 1975. 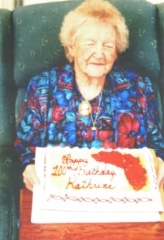 Kathrine Jensen died on Tuesday, June 7, 2005, at her daughter’s home in Council Bluffs, Iowa, at the age of 100 years, 8 months, and 3 days. Preceding Kathrine in death were her parents; her husband of 66 years, Nels Jensen; two sons, Carl Jensen and Elmer Jensen; one daughter, Ellen Kjeldgaard; two grandchildren; and two great-grandchildren. Survivors include two daughters, Elsie Baker of Council Bluffs, Iowa, and Betty Paulsen of Atlantic, Iowa; one son, Robert (Ellen) Jensen of Tennant, Iowa; one daughter-in-law, Frances Jensen of Harlan, Iowa; 22 grandchildren; 43 great-grandchildren; 11 great-great-grandchildren; and many friends and relatives in Denmark and the United States. Funeral services were held on Saturday, June 11, 2005, at the Trinity Lutheran Church in Avoca, Iowa, with Pastor Bernard Daiker and Michael Costello officiating. Kathy Soetmelk served as the organist, and Michael Costello was the soloist. Jason Weihs and Mitch Jensen were the eulogists. Honorary casket bearers were Pam Card, David Jensen, Wade Jensen, Randy Jensen, Dwayne Paulsen, and Kevin Kjeldgaard (deceased). Casket bearers were Kathe Weihs, Jeff Jensen, Jinea Calaby, Mitch Jensen, Julie Maguire, Rhonda Scott, Debra Williams, and Denise Deschamp. Burial was in the Graceland Cemetery in Avoca, Iowa. The Burmeister-Johannsen Funeral Home in Harlan was in charge of the arrangements.